After having done a half dozen dives with the Canon 7D in an Aquatica A7D housing, I can say without question that the combination of the two certainly does not disappoint. Upgrading from a Canon 40D/50D and Aquatica housing, the immediate thing to hit me was the brightness and size of the 7D viewfinder through the optional AquaView viewfinder. The second thing was the autofocus underwater – it is damn fast! The internals of the housing are a thing of beauty with the camera fitting precisely. My only negative comment out of the box is that it would have been nice to have the moisture alarm fitted at the factory, rather than doing it myself. 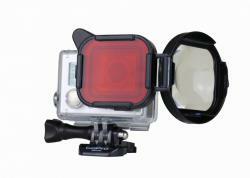 As has been reported in other reviews the Aquatica housing is small and feels light when compared to its predecessors. Shooting with my old lenses, strobes and ports the experience was seamless for still photography. Aperture, shutter speed and release are all where you want and expect them. The dials are easier to manipulate too when compared to my 50D housing as I presume they have bolder edges, which grip nicely even with thin temperate water gloves. The buttons (even with deep springs) are a breeze to press and the angled bank of buttons on the rear left of housing are very welcome. As with all Aquatica housings, the hand grips are divine – someone at Aquatica must have the exact size hand as I do. The Canon 7D’s beautiful LCD is shown off well. One of my minor gripes with the 50D was that the top of the screen was blocked at certain angles and the AquaView did not help things. The A7D seems to address this with a nicely positioned LCD window and even with the AquaView, viewing the screen was no issue at all. Several people have questioned the omission of the top LCD window, but I have no issue with this, as I never used it on the 40D housing. The Canon information screen makes the top LCD redundant in my view. I would like to comment on the buoyancy characteristics of the housing but do not have any empirical data to provide. What I can say is that with an 8” dome, 28mm lens, two DS-125s and 6” Stix arms plus 10 ounce floats, the rig is barely negative. It is however dome light causing the front to rotate upwards. With a flat port it is more negative but has less rotation effect. Overall I do not feel the housing is overly heaving or unwieldy, though keep in mind I was using Stix floatation. When it comes to underwater video, I am practically a virgin. I have done a couple of video dives (both macro and normal shooting) with the Canon 7D and have not been disappointed with the camera’s output. My skill level is another issue, which has resulted in a few challenges particularly around focusing. My initial macro efforts with a 60mm were woeful, so I quickly came to the conclusion that underwater macro video requires a tripod. I moved on to a 28mm f/1.8, which is much better more usable and have captured brief clips that I deem acceptable, but no impressive. I made the critical mistake of remapping the AF-ON button using the custom functions for still shooting, which effectively disabled the auto-focus capabilities whilst recording. I have since addressed this and used the C1 mode to create a video mode button mapping, as this is different from what I use whilst shooting stills in Manual mode. My limited experience shooting the Canon 28mm f/1.8 has taught me that the normal shooting range is possible, but difficult in practice. The conditions that I dived in were turbulent, resulting in stability and focus issues. I have seen moments of brilliance though (coming from a rank amateur videographer), which I hope I can work on and turn into something usable. Wide angle shooting is where I really want the video to work for me. The camera’s ergonomics in this scenario allow you to lock focus (as per still shooting), and then commence recording. As I do a lot of wreck diving in deep water, I was concerned about low light and high ISO performance. Personally I am pretty happy with the quality of the video even at ISO 800, though admittedly I have no baseline to compare to. The Start/Stop button is to date my only issue with the Aquatica housing. Unless you have the hands of a giant, you will not be able to depress the Start/Stop button with your thumb whilst your right hand is fully on the grip. I need to disengage from the right grip in order to reach the Start/Stop button even with my large hand size. For wide angle shooting this is not a big issue, but for macro and normal shooting I found it a challenge, as I had to remove my hand from the grip to start recording. I often lost focus lock as I had to move the camera from the focus plane it was pre-locked on. I thought a viable workaround would be to use AF-Live in video mode to reacquire focus lock, but underwater AF-Live is practically useless and something I don’t consider a viable solution. It renders the video that you are recording useless as the focus jumps about and seems to change exposure levels radically. I should also note that I have been shooting with the lens reasonably wide open (e.g. f/2.8-11) because I wanted to keep the ISO down and my lighting (a mere Fisheye HG20DX) does not have the power to light up the frame at smaller apertures. Opening up wider is possible, but I’m not sure I want such a wide depth of field for all shooting scenarios. I did not opt for the hydrophone option based on the logic that all the good video I have seen is accompanied by music. That said, the built in camera microphone seems to pickup noise quite well, so if you want to hear the Darth Vadar breathing noises in your video you can get that. Mounting the camera in the housing is a breeze. Unlike my previous Aquatica housing, you cannot get the memory card out whilst the camera is in the housing. Removing the camera from the housing even with lens and zoom collar attached is quite easy and doesn’t require the port to be removed. The port lock mechanism is also a nice feature, though only locks a single port or collar to the housing. If you have a dome and collar/s attached, it cannot lock the next bayonet. I am not sure if Aquatica have improved their button recesses, but I looks like there are holes in the side of them that allows water in more easily. This seems to allow fresh water to flush through the rear of the button when cleaning, as I am not getting the salt build up that I did on my old housing. The rugged black finish of the Aquatica housing feels nice and looks like it will hold up to a fair bit of abuse. I also found installation of the AquaView a lot easier than the previous housing, as there seems to be an angled edge machined into the housing hole, which makes the o-ring slide in easier. On my old housing the hole had hard edges and it tended to pinch o-rings as the AquaView slid in. Another point I have noticed after several dives is that the main bulkhead o-ring groove is a lot smoother than the previous 50D housing. I believe this will result in reduced flood risk as the o-ring seats better and does not have the tendency to jump out at the acute bends. I am a big fan of the strobe options that Aquatica provide. Nikonos, Ikelite and optical fibre which supports Inon and Sea & Sea are all supported. My choice was to have one Ikelite bulkhead and one optical fibre. My logic was that I currently shoot with DS-125s using a Y-splitter cable, but have ordered a pair of Inon z240s for smaller lighter strobes. Since the latter can also use a Y-splitter, I feel I have a lot of options. 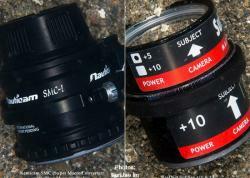 It also allows for TTL and camera based manual control (I presume), though these are only nice to haves for me. The Canon 7D’s technical capabilities make is an extremely desirable camera for its price and Aquatica have certainly come to the party with a housing that does it justice. It handles depths up to 130m/426ft with deep springs, which is a key feature for me as we regularly do dives well past the 60m depth rating of many of the other housings. I went into the Canon 7D purchase thinking that video was a nice to have. With the capability in my hands I have used the 7D for a fair bit of video above water and plan to do the same underwater. As such the Start/Stop button issue is disappointing though not a major issue given I mostly expect to shoot wide angle video of wrecks/caves as opposed to macro subjects. I have wondered whether the 5DmkII would have been a better choice, though ultimately cost is an issue and leveraging the investment/capability of the Tokina 10-17mm and Canon 60mm EF-S were deciding factors. Overall the 7D is an excellent camera and in some ways is superior to the 5DmkII. 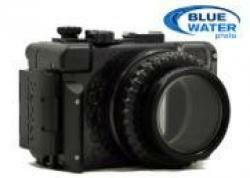 Its autofocus capabilities, LCD screen, video options and built-in strobe are all features that are attractive to the underwater shooter. Aquatica have produced a housing that has exceptional still shooting ergonomics and build quality. It has been a pleasure to shoot so far, so when coupled with Aquatica’s proven after market service I’m sure it will serve me well for years to come. Submitted by Craig (not verified) on Mon, 2011-01-10 16:18. The latches could benefit from a tertiary locking mechanism. Also the housing's flash reflectors for fiber optic strobe connection are not locked in position and may rotate causing the light from the on-camera flash to not reach the fiber optic window. Submitted by Mike (not verified) on Sun, 2010-11-07 10:18. Just wondering how you were able to install the moisture alarm? I purchased the alarm with a 7D housing, but can't figure out how to install it. The back of the housing is too small to install it in the way shown in the instructions, and I'm kind of at a loss where to attach it.